Anyway, the pizza is good. 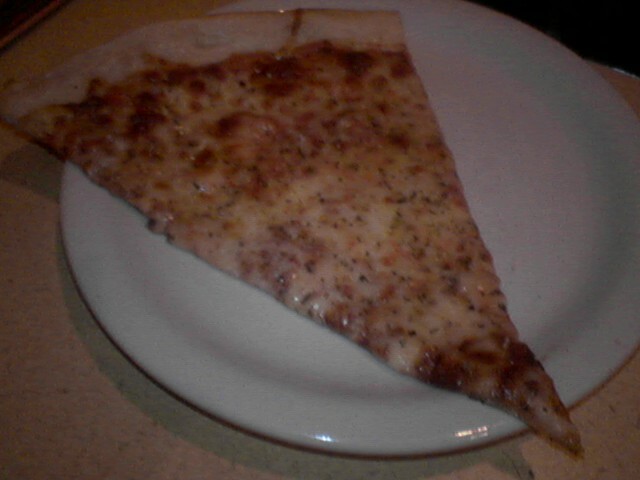 Thin crust, even cheese distribution, sizable slice. If you get there between 4 and 6, the beers (Laurelwood, Terminal Gravity… PBR) are a little cheaper. JMR and I can’t remember anything special about the sauce, so it can’t be awesome (or terrible, for that matter), but the overall experience is generally a positive one. Though the ladies behind the counter seem a bit distant, their lack of warmth is more than made up for by the pace at which they can serve the long lines that tend to spontaneously form in the shop. Even with a dozen people in front of you, it never seems to take more than a few minutes before you step away from the counter with a little slice of heaven in your hand. On a personal note: Last time I visited the Fac’, I bought $8.50 worth of ‘za and brew. When I checked my bank e-statement several days later, I noticed I was charged $13.50. I don’t know if this was an honest mistake, or if it was a well calculated attempt to shake me down, but I was/am pretty annoyed. Moral of the story is, either pay with cash, or hold on to your receipt so you can make sure you don’t get stiffed. This entry was posted in NE Portland, Thin Crust. Bookmark the permalink. For some reason, when I lived in the neighborhood, I was fascinated by the shakeable “yeast” this place would offer with the parm, crushed pepper, and herb condiment shakers. I had no clue what this stuff was, but I eagerly put it on all my slices, in the sincere hope it germinated something in my colon. I dunno, but in my mind it added another dimension to my slice experience. Perhaps it was a subconscious attempt to run with the anti-gentrification activist crowd that dominated the environs, as often I’m apt to act like quite the poseur and pretend that I can fight the man. From what I understand, they also own Pizza A Go Go on North Williams, which I’ve had mixed results with and which should be on your radar screen. Hm, I’ll have to make another trip over there soon. I’ve never noticed this shakeable “yeast”! Thanks for the info about Pizza A Go Go; I had no idea the Bella Faccia folks own it. I’ve been there a few times and happen to really like it. Hey there, DT & JMR. As co-owner of Bella Faccia, I’d like to thank you for your positive review – it’s sweet of you to take the time to love our pizza and promote us. Now, to clarify a couple of points. Firstly, for a long time people have been confused about the relationship of Bella and Go-Go. Jen and I co-own Bella and Jen co-owns Go-Go with a different partner. The actual businesses are not connected in any way and do not claim to have the same pizza, service, etc. It’s all good…it’s just that I feel that Bella needs to stand on it’s own reputation for fine pizza. About the credit card transaction, you are not alone in wondering what is up with that. My wonderful crew (are they really “distant”? )didn’t make a mistake nor were we pulling a fast one. It’s confusing but here’s the explanation: Our credit card processing company automatically adds 10-15% (I forget which) to the bill at the time of purchase, to cover the possibility of the customer writing in a gratuity on the tip line. At Bella, we adjust the tips at the end of the evening so the initial authorization amount must cover that possibilty. The bogus amount you saw on your e-statement was just tentative until the actual amount was taken from your bank account, a day or 2 later. I’m not sure why there was a $5.00 difference in your case. Did you happen to check your account again? I hope your annoyance is long gone and that you will enjoy a slice and a beer at Bella very soon! One more thing, since you are pizza lovers. I am opening up a new pizza/pasta place at 8225 N. Denver called “Pizza Fino”. Cool space, full bar and delicious food. Come check it out – doors open in mid-Feb.
Linda – I biked by last week and am hearing some really good words on the street. Thx for blessing North Portland! I had pizza for the first time at Bella Faccia with four friends. It was a little retro for us older ladies, but the pizza smelled wonderful so we gave it a try. We all agreed the Marguerita pizza was the best we have ever eaten; wonderful crust and just the right amout of garlic. None of us live close to Alberta Street, but we will make the trip for the great pizza and interesting shops. mmm. thanks for the comment, katie k.! it reminds me that i really want to get a bella faccia slice soon!